Few people realize that boxing has a history that is as rich and varied as most Asian martial arts. Nineteenth century boxing actually resembled today's mixed martial arts (MMA). Prior to the Marquess of Queensberry charter that incorporates the now mandatory gloves, London Prize Rules boxing or fisticuffs allowed throws as well as punches. These bare-knuckled events were brutal, and quite often matches had to be held in secret, lest the intervention of local constables. In the early twentieth century "open to all" tournaments in Japan were fairly common. One legend tells of a European prize fighter defeating one judoka after another when Okinawan karate virtuoso Choki Motobu stepped into the ring. "Maybe judo isn't the answer" proclaimed Motobu as he knocked out the boxer with a shuto (knife hand) to the temple in the second round. In 1950 Helio Gracie, the famous founder of Brazilian jiu-jitsu, challenged then heavyweight boxing champ Joe Louis to a no-holds-barred match. Louis, who had nothing to gain and everything to lose with such an event, wisely declined. 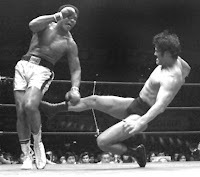 Two decades later Japanese grappler Antonio Inoki took on Muhammad Ali in a 15-rounder. Inoki was billed as a pro wrestler, but he previously defeated numerous martial art exponents in legit contests. The match was a bizarre one as Inoki spent almost the entire time on the ground in a futile attempt to kick or sweep out Ali's legs. The fight was declared a draw, but even Ali's typical pre-fight hyping tantrums couldn't save this hopeless spectacle. When MMA bouts first made their appearance in the 90s there was some clamor as to whether a fading Mike Tyson would make an interesting opponent. How do you think Tyson would have fared against somebody like Royce Gracie? Gracie would've had his work cut out for him. Don't forget that Tyson was disqualified during a title fight when he tried to bite Evander Holyfield's ear off. It was a dark moment for boxing and Mike Tyson in time became his own worst enemy. Unlike traditional martial arts, nobody ever seems to question the validity or street effectiveness of boxing. Indeed, boxing as a viable method of self defense is explored in this TDA Training article. Boxing is still one of the most dangerous sports as there have been a number of ring deaths through the years, to say nothing of the long term health risks involved with being a career fighter. Recently MMA suffered its first fatality as the result of a sanctioned match. Some proponents of MMA insist that it's safer than boxing, but the jury is still out on that verdict. Will MMA even be able to survive the way "The Sweet Science" has for so many years? Time will tell. Hey, Interesting posting...I feel that UFC and MMA is getting by on a whim and a hairsbreath and that soon someone is going to die in volume or at the very least the catastrophic injuries I know these guys are enduring for fame and fortune will come to light. I have viewed only one or two small instances on TV and Youtube to realize that it is a miracle that these guys are not dying or becoming vegetables. The gloves used and the blatant viciousness with which these guys pummel about the head and face is no where near the same as boxing. Anyway, it is a matter of time. I did watch one video of the process of a MMA/UFC fighter AFTER the fight and I can not understand the desire to take this kind of punishment. In the end they and their loved ones will suffer and endure the long term effects. I think MMA will survive. The top fighters nowadays seem to be training for MMA only, and see boxing as just a small part of that. Look at any weight class in MMA and there are lots of world class fighters. Boxing dosent have the same amount of world class fighters as 20 years ago. "One legend tells of a European prize fighter defeating one judoka after another when Okinawan karate virtuoso Choki Motobu stepped into the ring. "Maybe judo isn't the answer" proclaimed Motobu as he knocked out the boxer with a shuto (knife hand) to the temple in the second round." Now THAT is a great story! I hadn't heard that one before. It does seem that way. Like you, I haven't checked out too many of these matches, at least not recently. But only one death in 15 or so years of MMA? I don't mean to trivialize the death of Sam Vasquez , but that's a favorable stat compared to boxing. I think a lot of it has to do with the fact that these MMA matches end relatively quickly. Compare that to a 10-round boxing fight, which is 30 minutes of fighting. The object in boxing is to KO your opponent. My understanding is that most MMA matches end up with one of the fighters tapping out. Big difference, especially over the long haul. Welcome to my site Marks. I think MMA will survive. The top fighters nowadays seem to be training for MMA only, and see boxing as just a small part of that. I agree. The first MMA fighters came from a traditional martial arts background, but I don't see how TMA has anything to offer for this comparatively new sport. And some of the nuances of boxing - the feint, the jab, slipping, probably have little relevance in MMA. It's a famous story in karate lore. Actually there are a few versions of it around, this one I got from the writings of Shoshin Nagamine, a shorin-ryu master who learned free-style sparring from Motobu c.1930. So far, it appears to be that way. When you watch an MMA match, it can look brutal, I'll grant that. But one stat I looked at says boxing claims 11 lives per year! I believe some of those figures may include long-term complications, such as those that arise from Alzheimer's and other forms of dementia which eventually affect the body. Of course MMA players could be susceptible to these things in time, but it's too early to say. MMA, as you said yourself, is really a return to boxing's roots. A couple of points to clarify. First regarding the Ali/Inoki exhibition. The rules were heavily in favor of Ali, but pro wrestling in Japan continues to be much more of a real combative than the spectacle here in the USA. It's a different animal and many "pro-wrestlers" in Japan regularly compete in MMA events. Regarding the relative safety of MMA, it remains to be seen. There are a lot more boxers than MMA fighters. Sheer numbers might account for some of it. But I read somewhere that combat sports and skydiving together aren't even close to as dangerous as fishing. Lastly, big news in the boxing/MMA world are the rumors of Floyd Mayweather Jr. considering taking a sanctioned MMA match. I personally don't see it happening as he doesn't have anything to gain and much to lose. But it would be interesting to see. As a bona fide world class athlete, he could pick up some ground skill and might be able to compete within a year or two.